For years now I’ve been writing about my healing process: how I’ve learned, grown and accepted my parents’ suicides. But in truth, I’ve only really been delving into my mother’s issues and motivations and how I’ve learned compassion for her so long after the fact. While listening to Doreen Virtue’s Weekly Angel Reading today, I was smacked between the eyes by the fact that while, on a conscious level, I understand my dad’s motivation, it has not brought me any closer to truly healing and forgiving his actions. In fact, if I’m truly honest with myself, I still hold a lot of hurt over the fact that he never confided in me about his failing health and the pain he suffered. Instead, whether by intent or circumstance, he pushed me away with his constant negativity and complaints about the people around him. Until I come to terms with this and find compassion inside myself, not only for his final act, but for everything which came before, I’m still carrying a lot of baggage which thwarts my own forward progress. While we were growing up, my sister was always closer to my mom; in fact, most people noticed the favoritism my mom played. I was, though not by default as might be imagined, closer to my father. He saw the humor in life and the beauty beneath the surface of the people around him. He was an amazing judge of character (something I didn’t inherit, I’m afraid), quick-witted and playful whereas my mother was always looking to others for validation, often trying too hard, and slow to find the humor in even the most obvious places. My dad was not, however, the touchy-feely affectionate sort. You knew he loved you when he teased you unmercifully, rather than when he pulled you into his arms for a hug (I don’t even remember him doing that until I was much older). But while mom’s hugs seemed to lack sincerity in my eyes, dad’s teasing made me feel loved and accepted just the way I was. Which is, perhaps, why it hurt so much when he started shutting me out. First, a reminder that neither his life nor his death was about me. This is something I came to realize about the method in which my parents ended their lives. They were both, in their own way, in extreme pain and believed that ending their human existence was the only way to find relief. That’s it, plain and simple. Second: I was led to pull three cards from my Spiral Tarot deck and lay them before me as I write. 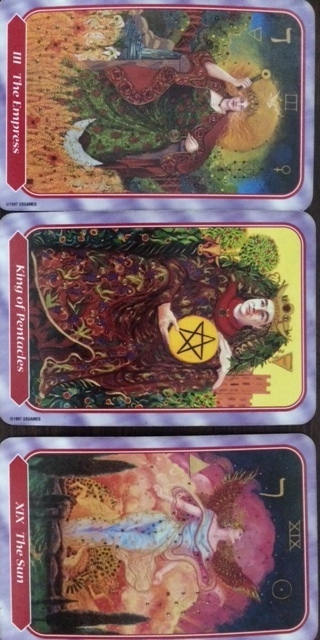 They are, from left to right: The Empress, The King of Pentacles and The Sun. The Empress represents me, which is a dramatic change from the cards I’ve previously identified with: The High Priestess and The Queen of Pentacles. To me, the Empress is a softer, more nurturing image than ones I’m accustomed to feeling. the King of Pentacles represents my father: Strong, protective, financially savvy, a business owner and a bit of a benevolent dictator. The Sun represents outcome, but more, it stands for my enlightenment, my understanding of the real relationship I had with my father and clearing the clouds away to allow the truth to spring forth and allow me to blossom and grow in my own right. With my mom, I knew I never really measured up to her expectations which allowed me to finally just let go and accept that I made my own choices and whether she accepted them or not was really not important. In some ways, I believe my dad accepted my choices, but in others, I’m certain he didn’t. He would tell me when he didn’t agree with what I was doing, grudgingly leaving it to me whether to follow his advice or not. He didn’t play the emotional games my mom did (she was, after all, the Queen of Guilt), but yet, I feel that I did fail to measure up to his standards. In later years, the person he seemed closest to of my generation was my ex-brother-in-law. He, alone knew of my father’s failing health and spent a lot of time playing cards and just talking to Dad. I will forever be grateful to John for not only being able but also for taking the time to fill that gap in Dad’s life. Before I meditated, I had a lot of nasty, bitter things to say about the woman Dad dated after Mom died, but while coming to terms with my feelings of hurt at being shut out, I also gained insight into their relationship. I don’t think, despite the friction in their marriage, that Dad ever really got over losing Mom or being the one to find her lying cold in the bed they’d shared for nearly 40 years with a plastic bag obscuring her face. The woman he turned to had lost her husband not long before, so I’m sure that in a lot of ways, they turned to each other out of a mutual understanding and loneliness. They had known each other for decades and had the same group of friends, so it was an easy transition. Yet Dad never let her move in, insisted on several nights a week to himself and squashed her attempts at making their relationship more permanent. She, in turn, found others with whom to engage in activities Dad wouldn’t. Despite the line he drew in the sand with her, she felt she deserved something after his passing, even though, financially at least, she was in far better shape than he. Until today, I allowed her angry, bitter nature, some of which was exacerbated by poor health, to be mimicked in my own mind and behavior. Today I finally realized that those feelings belong to her alone. They are not and never were mine to feel so as I released myself from responsibility for Dad’s behavior, I let go of any attachment to hers as well. I know this sounds overly simplistic, and in some ways it is. I need to travel a few more miles before my acceptance of their behavior and realization that it had nothing to do with me truly resolve themselves peacefully. But like any other leap of faith, the first step down a new road is the hardest of all to take. Finally Ready to Move On? I’ve done a lot of things to delay actually sitting down and tearing my first major brain-child apart: reading books on writing, reading a couple of novels, playing games, meditating and reading crit notes from another writer (some of those were painful, some were spot on and matched what I had already realized and some just seemed overly picky. However, all of them are valuable and will be reviewed more thoroughly after I do my own cuts, pastes, hacks and slashes), all brought me just a little closer to the painful but necessary process before me, at least, assuming I still plan to actually publish the darn thing! The long and the short of it is, this is me, releasing a few more demons so I can get on with my life’s purpose. 1. I am grateful that I’ve learned to be honest with myself. 2. I am grateful for the lessons I’ve learned and the people who have helped me learn them. 3. I am grateful for examples, both good and bad. The bad ones make me look deep within myself and play devil’s advocate. They make me see the sides of myself which are not only less pretty, but could use some work. Heaven forbid I was perfect and had nothing to improve upon! 4. I am grateful for my health and for knowing when I just need to withdraw from society for a little while and work through my own issues, both overtly and by just escaping for a little while. 5. I am grateful for abundance: health, happiness, love, joy, opportunities, intelligence, humor, challenges, lessons, harmony, peace, understanding, kindness, prosperity and philanthropy.